The Pony Harvest 'happened' in February 2004 when front man Richard Bradley, first set foot in a Sheffield studio to record 'The Planets'( a beautifully comic hitchhikers guide to the analogue galaxy) and 'the worst secret agent in the world'(a melancholic cossack spy thriller). 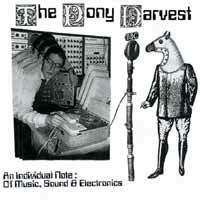 The pony Harvest sound is born of synthesisers (ems synthi), BBC sound effects records, toy instruments, field recordings, household objects and anything else they can get a sound out of, oh! and a keyboard from Chesterfield flea market that cost £8. Richard Bradley-24-(librarian about town and keen 'twitcher'), on synths, vocals, mellotron, omichord, melodica and piano. Olly Hall-(collector of frog-shaped paper-weights and pro gaelic footballer) on bass. and lastly the 7 foot tall prog-tronic, cape wearing Tom Castle on flute.